La Plage et du Bord de Mer, where the beach is a few light steps away. 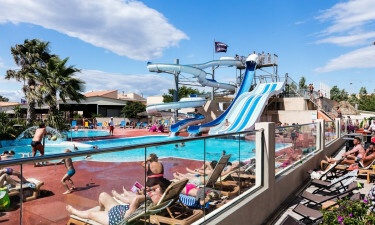 The luxury camping site of La Plage et du Bord de Mer is a family-friendly park directly beside the beach of Valras, in the Hérault department of Languedoc. Its coastal location and proximity to picturesque ports, villages and towns mean that a new adventure is never far away. Why stay at La Plage et du Bord de Mer? Young children will love the lighthouse in the middle of the toddler’s pool and the gently sloping water slide. The giant, coiled water chute, high-speed kamikaze slide and 4-lane water slides should have the pulses of older children racing. Adults can take a dip or unwind in the areas equipped with water jets, whirlpool seats and hot tubs, or simply laze poolside with an ice cold drink. The pool complex also has inflatable water games and hosts daily aqua fitness classes in high season. The giant inflatables in the play area will delight the little ones. 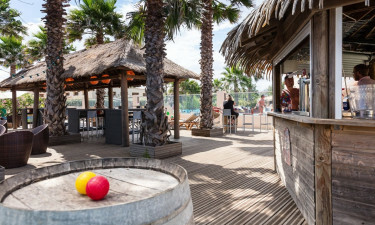 Beach volleyball, football, tennis and boules, plus supervised daily fitness and aerobic classes in July and August aim to tempt you off that sun-lounger. 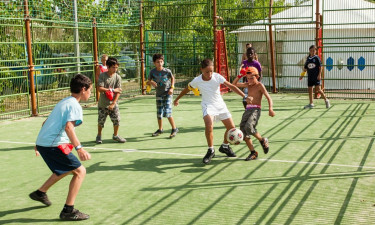 Clubs for children and teenagers in high season offer the ideal opportunity for them to socialize whilst participating in creative and fun activities. Feel like exploring? Hire bicycles and set off on a journey of discovery along the coast or inland! In summer, the bar becomes the focal point for the evening’s entertainment, an ever-changing roster of live shows, cabaret, dancing and more. Hire a pedalo, go on a wild banana boat ride, or build a sand castle with the kids. At Valras beach there is enough sand and water for everyone. A variety of water sports, such as paddle boarding, windsurfing and kayaking, are also available. Agde, Béziers and Narbonne make fascinating day trip destinations, whilst the magnificent Regional Natural Park of Narbonne, with its 200km of trails, is a gift to hikers and nature lovers. The campsite restaurant serves traditional Mediterranean cuisine, with terrace and poolside areas for enjoying the evening’s entertainment. Takeaway is available from The Snack, whilst The Coin Gourmand serves ice cream and crêpes. Shaded by palm trees or a Berber tent, La Palmeraie restaurant is open from late June until the end of August and serves Mediterranean wood-fired specialities. The cocktail bar, in addition to serving a wide selection of drinks, also hosts a weekly wine tasting evening. The mini-market, bakery, souvenir shop and newsagent cater to all your immediate luxury camping needs.